The P-36 or Curtiss Model 75 Hawk, commonly called the Mohawk, began life as a private venture, soldiered bravely in foreign colours, and enjoyed modest if unspectacular success as the last major USAAC fighter before the outbreak of hostilities in World War II. A monoplane low-wing pursuit ship with retractable landing gear and an enclosed cockpit, the Model 75 prototype was powered by a 671kW Wright XR-1670-5 engine and was initially scrutinised by the US Army in May 1935 but not ordered, although Curtiss obtained permission to provide details to several foreign governments. Re-engined with an 633kW Wright R-1820 Twin Wasp radial and called Model 75B, the craft was re-examined by the Army in April 1936, when it lost a major production order to the similar Seversky P-35. As consolation, Curtiss received a contract for three service-test Y1P-36s, delivered in February 1937. Based on Y1P-36 evaluation at Wright Field, Ohio, there followed in July 1937 a production order for 210 P-36A airframes, the Army's largest fighter contract since World War I. Delivery began in April 1938 at about the same time that 112 examples of a less complex export version, the Hawk Model 75M, were purchased by the Chinese Nationalist air force; 12 similar Hawk Model 75N and 29 Hawk Model 75O aircraft went to Siam and Argentina respectively, a further 20 being assembled locally in the latter country. Two export Hawk Model 75Qs went to China, one being presented to General Claire Chennault by Madame Chiang Kai-shek. In the USA, the relatively new P-36As were rapidly considered obsolescent as war clouds gathered. The sole P-36B, a converted P-36A model, was powered by a 745kW Pratt & Whitney R-1830-25 radial. The XP-36D was tested with two cowl-mounted 12.7mm and four wing-mounted 7.62mm guns. The XP-36E was also a solitary armament test ship with one nose 12.7mm and no fewer than eight wing 7.62mm guns. The XP-36F, also a one-off conversion, had two underwing 23mm Madsen cannon plus one 7.62mm and one 12.7mm nose guns. Production efforts shifted to 31 examples of the P-36C with engine improvements. Examples of the Hawk Model 75A went to France and a few fell into Vichy French hands, resulting in aircraft of this type confronting each other in combat. The bulk of the French order was diverted to the UK's Royal Air Force, which assigned the familiar Mohawk nickname and operated the type with lacklustre results. A total of 24 Hawk Model 75A-6 machines reached Norway before a 1940 embargo by President Roosevelt on US fighter deliveries to Scandinavia. The 30 P-36G aircraft had been intended as export Hawk Model 75As for Norway but were operated by the USAAC. The US Army dispersed its modest fleet of 243 P-36s widely. 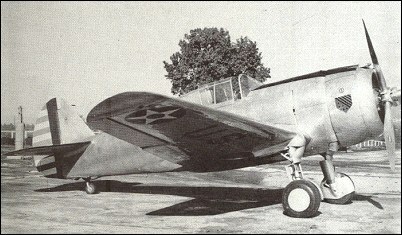 The 18th and 20th Pursuit Groups operated the P-36A, the latter employing no fewer than three squadrons at Barksdale Field, Louisiana. As late as 1942, while war raged in the Aleutians, the 28th Composite Group operated P-36As in Alaska. The XP-36B was tested exhaustively at Wright Field, Ohio. The 1st Pursuit Group, Selfridge Field, Michigan, despatched a dozen P-36Cs to the National Air Races in Cleveland, Ohio, in September 1939, each machine painted in an elaborate, one-of-a-kind camouflage scheme which, ironically, was never used in actual exercises or war games. Although the basic design was by then long in the tooth and no match for the fighters of Messerschmitt and Mitsubishi, the XP-36D, XP-36E and XP-36F were included in a major exposition of 'modern' fighters at Boiling Field, Washington, DC, in January 1940. P-36 or Hawk 75 variants also served, sooner or later, with the air arms of the Netherlands, Finland, India, Portugal and South Africa, and a pristine example is on display at the Air Force Museum in Dayton, Ohio. As Admiral Isoru Yamamoto's fleet approached the Hawaiian Islands, a handful of P-36s was also located amid the heat and red clay of Wheeler Field, Hawaii. "It all seems so long ago," ponders Lieutenant Colonel Stephen Barneyback, running his eyes over Wheeler Field where the first blows were struck. "This place was a tropical paradise. We were not ready. We had no idea what was coming." Barneyback recalls that P-36 pilots were half-awake, stunned, and totally outclassed, neither as manoeuvrable nor as well-armed as the incoming waves of Mitsubishi Zeros. "If Sanders hadn't given the order to disperse some of the P-36s the night before, all of them would have been caught on the ground." Amid the 7 December 1941 Japanese carrier strike on nearby Pearl Harbor, First Lieutenant Lewis M. Sanders, commander of the 46th Pursuit Squadron, got aloft from Wheeler Field with four P-36As and led his men in shooting down three attacking aircraft. Second Lieutenant Philip M. Rasmussen was credited with one of the kills, as was Second Lieutenant George H. Sterling, Jr, who was killed in the action, one of the first American fatalities of the conflict. The era of pursuit fighter development between world wars was over, and the Curtiss P-36 had ended its American combat service the moment a new era arrived. tested by the A&AEE @ Farnborough in Jan 41 it reached 302mph. The worst was the Finnish a/c which struggled to reach 280mph. The Finns were particularly scathing in there comments. So to any Gamers out there if the speed of the Hawk 75a-4in the game is 459kph it is correct. my cousin was killed in a P-36 on 10/30/1941 on a training mission. His plane burst into flames and the plane plummeted into the water. He was out of Paine Field with the 56th Pursuit Squadron. I am searching for information about this accident. richard peters: The .50 and .30 cal MGs have nearly the same muzzle velocities, a little over 2400 f/s. At the lonest range where a pilot could ever hope to score a hit on an enemy plane, (400 yd) the flight time is about 0.5 sec, and the bullet drop for which one has to adjust the sights will be only about 4 feet. Once the guns are aligned to strike the point aimed at 400 yards, the bullets will all be within 2 feet of the line of sight at all closer ranges. So while the .50 cal bullets might strike the target 2 inches below the .30 cal bullets, at, say 200 yards range, which would matter if we were shooting at a beer can, it is a trivial difference compared to the size of an enemy airplane. For practical purposes, the bullets will all go to where the sights are pointed. The problem is pointing the sight to where the enemy plane is going to be a half-second after you hit the trigger. After all, he can be moving at 500 feet per second. this for Don Tillery- you might want to check out the U.S.A.F. museum. they have a bare metal bird of one flown by 2nd Lt. phil Rassmussen during Pearl harbor attack. One big difference between the P-36 and P-40 was that the P-36 was basically a pre-war fighter which lacked armor and self-sealing fuel tanks. Operational versions of the P-40 Tomahawk, Kittyhawk and Warhawk included those items, all of which added considerable weight. Any comparisons of the performance of the P-36 against that of the P-40 must take that factor into consideration. IJAAF pilots who flew in Burma lists the RAF Mohawks as the most formidable enemy in a close in dogfight. The RAF pilots would not "hit and run" but would challenge the Hayabusas in one to one combat and the Mohawks, though a little heavier, were more powerful and better armed, so I think in the same way that Zero pilots respected the Wildcats, the Mohawks were respected by the IJAAF pilots. Charles Lindbergh had a P-36 (and for a short while, a P-35), assigned to him for personal transportation in 1938-39 as Colonel in the Army Air Corps doing NACA work and involved in research with the various aircraft manufacturers. He made numerous comments about their shortcomings in his Wartime Journals, compared to German fighters (which he had seen/flown in Germany visits). If im not mistaken the p-36 could climb faster than the p-40 and had a higher service ceiling. But slower speed. Thats odd you would think they would have just made the p-36 faster. I need information on the eperimental installation of a contra-rotating propeller on a P-36, as shown in a short film segement on PBS' "History Detectives". Looks kinda like an early version of a P-47. Was there a "TP-36" (or other designation) trainer model two-seater built? This plane had guns of different calibres. Does anyone know if they were fired together or could be fired seprately? Surely they would have had different trajectories - or have I goofed there? Any help appreciated. P-36. Right along Curtiss and people ordering the export models switched back and forth between the engines. Wright won the contract to provide engines for the first DC-3s but they were not delivering the promised 1,000 horse power so P&W was still in the game. After trying every way anybody could think of to produce a reliable time proven lead-babbit alloy main bearing they tried a silver rich alloy that solved the problem. At about the same time Wright found ways to produce the desired power. I believe it was buyers choice, P&W or Wright engines, as long as DC-3s were built. Pratt and Whitney won the contract to provide engines for USAAC production P-36s. There were overseas customers that preferred the Wright engine. They were used in different YP models as well but the production model P-36s had P&W R-1830 engines. there is a slip in the text re: wright R1820 should read cyclone, the 9 cylinder single row as opposed to Pratt & whitney 1830 14 cylinder two row 1830, the twin wasp. ! remember Chennault's personal Hawk 75 being a fixed and faired gear with wright Cyclone and very shiny. The R-1820 was a SINGLE row 9 cylinder engine....The R-1830 was a 14 cyl twin row engine as I remember it.